More than 30 kids and adults with vision loss across the Sacramento region came together in November to learn Paralympic sports at Society for the Blind in Sacramento. The all-day event was the grand finale to Society for the Blind’s participation in the National Fitness Challenge sponsored by the United States Association of Blind Athletes and Anthem Foundation. The Paralympic event included clinics in rowing, golf, judo and goalball, as well as lunch and presentations by athletes leading the clinics. Society for the Blind finished seventh in the challenge out of 13 groups across the nation – and one of only three in California – that competed in the United States Association of Blind Athletes’ and Anthem Blue Cross Foundation’s fifth annual National Fitness Challenge. Society for the Blind and its competitors provided more than 300 blind and visually impaired youth and adults with an opportunity to increase their physical fitness levels and live healthier, more active lives. Other California participants were Junior Blind in Los Angeles and Lighthouse for the Blind and Visually Impaired in the Bay Area. When the National Fitness Challenge kicked off in Sacramento this past spring, participants who signed up with Society for the Blind had a number of physically challenging activities to look forward to. 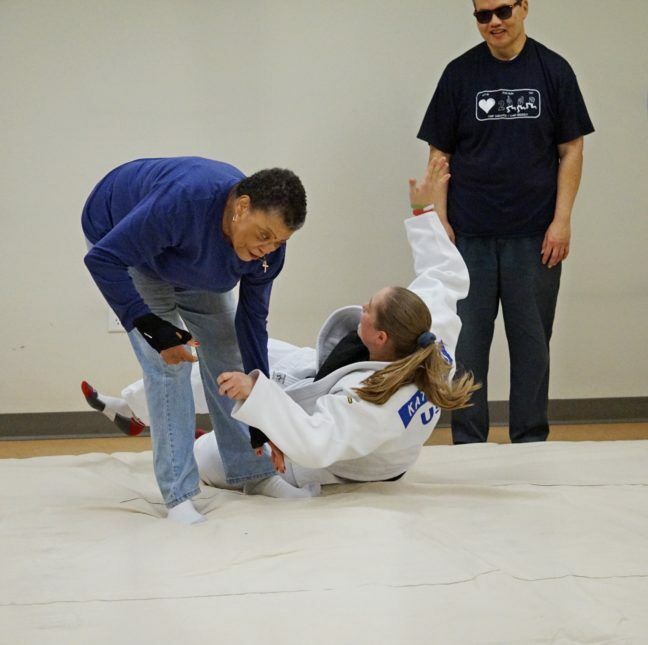 In efforts to increase participants’ levels and step counts, staff at Society for the Blind worked with dance instructors, personal trainers, judo instructors and more. In addition to raising their overall physical activity, participants became more aware of opportunities in their community. For more than 60 years, Society for the Blind has created innovative ways to empower individuals living with low vision or blindness to discover, develop and achieve their full potential. Society for the Blind has grown from a dedicated group of volunteers that included the Lions Clubs of America to a nationally recognized agency and the only comprehensive rehabilitative teaching center that provides services for a 27-county region of northern California. The nonprofit provides low-vision eye care, life and job skills training, mentorship, and access to tools to maintain independence for 6,000 youth, adults and seniors experiencing vision loss each year. For more information or to make a donation: www.SocietyfortheBlind.org. Since its founding in 1976, USABA, a community-based organization of the United States Olympic Committee, has reached more than 100,000 blind individuals. The organization has emerged as more than just a world-class trainer of blind athletes, it has become a champion of the abilities of Americans who are legally blind with a mission to enhance the lives of blind and visually impaired people by providing the opportunity for participation in sports and physical activity. For more information: www.usaba.org, www.twitter.com/USABA or on Facebook as United States Association of Blind Athletes. In addition to grant funding, Anthem Blue Cross Foundation will provide volunteers at events across the state during the nine-month program. Local employees will have the opportunity to meet participants and help them achieve their health and wellness goals. Through charitable grant making, the Anthem Blue Cross Foundation LLC, an independent licensee of the Blue Cross Association promotes Anthem Blue Cross’s inherent commitment to enhance the health and well-being of individuals and families in communities that the company serves. The foundation focuses its funding on strategic initiatives that address and provide innovative solutions to health care challenges, as well as promoting the Healthy Generations Program, a multi-generational initiative that targets specific disease states and medical conditions. These include: prenatal care in the first trimester, low birth weight babies, cardiac morbidity rates, long term activities that decrease obesity and increase physical activity, diabetes prevalence in adult populations, adult pneumococcal and influenza vaccinations and smoking cessation. The Foundation also coordinates the company’s year-round Associate Giving program and its parent foundation provides a 50 percent match of associates’ pledges. ®ANTHEM is a registered trademark of Anthem Insurance Companies, Inc. The Blue Cross names and symbol are registered marks of the Blue Cross Association. Anthem Blue Cross is the trade name of Blue Cross of California. Anthem Blue Cross and Anthem Blue Cross Life and Health Insurance Company are independent licensees of the Blue Cross Association. For more information: www.twitter.com/AskAnthem, www.twitter.com/AnthemBC_News or www.facebook.com/AskAnthem.